In less than 5 minutes a day! — we are truly powerful beings with unlimited potential." FACT: People with ultimate self-confidence get MORE of what they really want in life. They become ultimate achievers — earning more, accomplishing more, loving more, and living more. Not just some of the time. ALL the time. Though I believe that you certainly possess enough self-confidence to achieve all that you have, it’s a privileged group of people who reach a level of ultimate self-confidence. At that superior level of self-confidence, you never fear. You never doubt. Every minute of every day, you believe in yourself. And others believe in you, too. You know in your heart of hearts there is nothing you cannot do. Therefore you achieve everything you’ve ever wanted. Easily, effortlessly, confidently. I’m sure you know people like this. Those who seem to have a built-in magnet to attract everything good — money, career growth, friends, great health. While at the same time, they seem to also be protected by a force field that shields them from everything bad — fear, worry, debt, disease. You know the ones. The winner who takes home most of the awards at your company’s annual meeting. Or the business owner who always manages to grow her business regardless of the economy. Or the one at the party always surrounded by a group of attractive people laughing and having fun. It’s as if they have a rocket strapped to their backs. And while everyone else trudges along in hopes of a greater future, they are already there. How? Not because of their upbringing or their environment. Their superior self-confidence is the engine that propels them to success! You see, ultimate self-confidence is the foundation that makes everything else possible. Your Relationships: You will meet, attract, and create deep bonding and happier relationships with family, friends, and colleagues. Your Career or Business: You will advance far in your career or business once you confidently share new ideas, make decisions, and take action. Your Finances: You will create a far more abundant lifestyle for yourself and your family from new opportunities that come your way. Your Happiness: You will experience a renewed zest and enthusiasm for life knowing you are being and expressing the person you were meant to be. More important than self-worth, self-image, or self-esteem, self-confidence affects every single aspect of your life. With an abundance of self-confidence, it’s as if you have Lady Luck on your side, and everything just falls into place. You’re happier, more energetic, and more alive. Life starts handing you one opportunity after another. In a minute, I will show you just how you can reach this exceptional level of self-confidence and start enjoying a brighter, unstoppable future. Because the alternative — living WITHOUT ultimate self-confidence — can be like trudging through each day with a 50-pound backpack filled with doubt, fear, pain, regret, and shame. If you lack ultimate self-confidence, you won’t have the belief that you can reach your goals. At the first setback, you will quit or give up on your dreams. Without self-confidence, you won’t speak up for yourself at the next business meeting. Therefore, you will have to settle for what the world gives you — which usually isn’t much. Without self-confidence, you won’t walk up to that person you’d like to meet at the next social gathering. As a result, you’ll miss out on potential business and friendship opportunities. The bottom line is this: If you don’t have ultimate self-confidence, you’ll have to settle for whatever crumbs are left over after the people who DO have ultimate self-confidence have helped themselves to the bounty of life. How can you gain the ultimate self-confidence that automatically takes you farther than anything else you’ve tried? Most people are taking the most powerful tool in the world — their brain — and using it against themselves. How? By thinking and behaving as if their beliefs were true. If at a subconscious level — far below rational thought — you believe that you aren’t deserving of a promotion, your brain would force you to behave in a manner to ensure you DON’T get that promotion. If deep down, you subconsciously believe you won’t score well on the test, or won’t shoot a good round on the golf course, or won’t say anything funny to your date, or won’t deliver a flawless presentation, or won’t do well in your job interview… your brain will act accordingly. It will force the negative action, delivering the negative result. Good or bad, your beliefs have made you who you are today. In order to change your actions and your results, you must first change your beliefs — specifically your beliefs about your own value to yourself, to other people, and to the world. But just as you may have trained yourself to NOT believe in yourself, you can learn the Power Habits of believing in yourself and everything you stand for! Right now, I’m giving you the tools to change your beliefs — and your life — by learning how to benefit from ultimate self-confidence… at home, at work, always! My name is Noah St. John. Today, I’m thankful to literally be living my dream life each and every day. I have the most beautiful and caring wife. I’m a bestselling author. And I’ve appeared in more than 2,000 media outlets, including CNN, ABC, NBC, NPR, Parade magazine and The Washington Post. I’m in the best shape of my life, and I have more money than I’ll ever spend. Without question, I’m the most confident person I know. Which is light years from where I used to be. Growing up, I was the poster child for zero self-confidence. As a young man, I wore Coke-bottle eyeglasses, had acne that covered my face, had freakishly big hair and gaps in my teeth when I smiled — if I smiled. I was scrawny, skinny, and looked like a first-class nerd. Then I grew up. Though I excelled in school, I failed at life. I hated my job, hated living in a cramped one-bedroom apartment, and hated just getting by. I ended up in an abusive relationship, $40,000 in debt, and moving back into my parents’ basement. Then quite by accident, I finally discovered the secret - the answer that changed my entire life. I realized how to ALLOW myself to succeed. As much as I wanted to reach my goals and fulfill my destiny - my conscious desire - I was also unconsciously engaging in beliefs and habits that were preventing me from succeeding. and would change my results for the better. Remember, I was the poster child for NO self-confidence. And if I can use my Power Habits to transform myself into a person with skyscraping self-confidence, ANYONE can! And if you already have high self-confidence, my system will take you to an entire new realm of peak performance! After I discovered the secrets to achieving ultimate self-confidence, I wanted to share it with the world. People around the world started sending me cards, letters, and e-mails; sharing their stories on social media; and telling me in our seminars and mastermind groups about the amazing results they were getting simply by using my simple method to drive their self-confidence to new heights. Winning golf tournaments and other sporting events for the first time . . . and many, many, many more. Before they knew about my Power Habits of Ultimate Self-Confidence, they may have had the skills, the motivation, the drive, and the instruction to achieve these great feats. But their lack of self-confidence held them back. The second they gained the belief system, the self-confidence, and the Power Habits to chase their dreams, they were off and running! Now, I want the same life-changing opportunities for YOU! 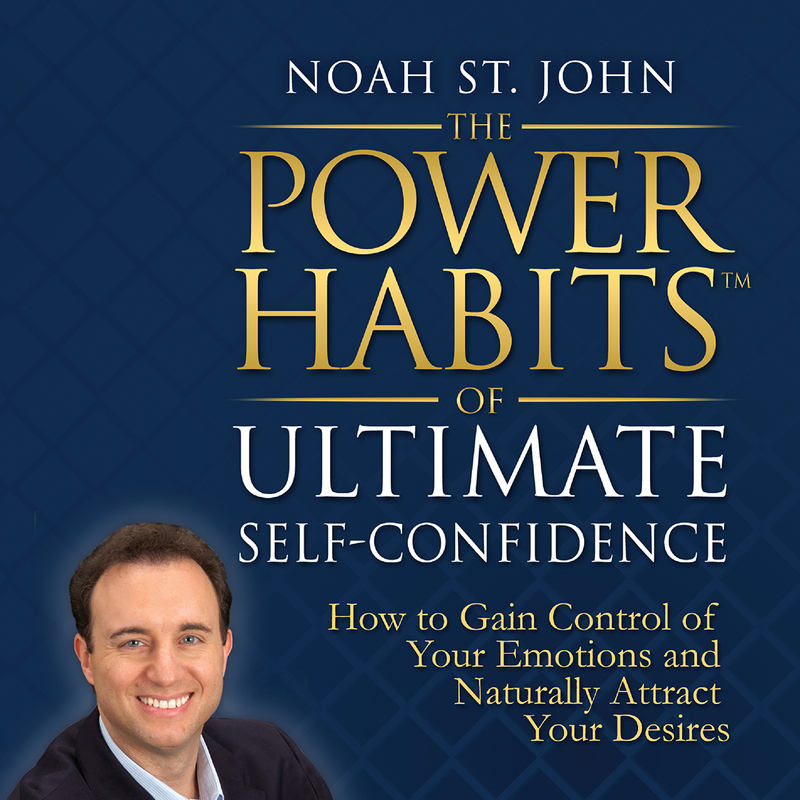 It's my great honor to present my NEWEST Nightingale-Conant audio program The Power Habits of Ultimate Self-Confidence. Throughout this multimedia program consisting of 10 audio sessions and my Power Habits Action Guide, you’ll have the tools that will help you to build unstoppable self-confidence to enjoy happier relationships and more success in life and business. And beyond your self-confidence, I’ll share with you precisely how to overcome social anxiety, eliminate the fear of public speaking, feel more relaxed and stress-free, and be in control in any business or social setting. After working with literally tens of thousands of people and organizations in more than 120 countries, let me assure you that I have a proven system that take any level of self-confidence and ratchet it up to a much higher level. What you must do EVERY MORNING that will make all of your decisions — big and small ones — crystal clear. In mere minutes, you’ll know yourself, your beliefs, and your true feelings better than ever before. The 3 things you must do to master your INNER GAME of self-confidence. Once you are in complete control of your thoughts, beliefs, desires, values, and character, you’ll have the mindset and conviction to achieve ANYTHING. Always. Learn how to always dominate your OUTER GAME of self-confidence. Expect your decisions, your habits, and your actions to create extraordinary career, financial, and relationship opportunities. Learn how to adopt the mysterious secrets of “The Naturals” — those who can do no wrong and always win at life. You’ll discover how to think, believe, and act like them so you too can enjoy an excess of confidence and success. Turn the worry and fear of public speaking into self-confidence and success by using the A.P.P.L.A.U.S.E. Method. Your worst fear may just lead to career opportunities. Discover how to avoid these 8 Self-Confidence Killers! You probably unknowingly engage in most of these habits today. Learn to recognize the warning signs, so you are always 100% self-confident! Re-focus your mind, energy, and confidence using my simple 3-step meditation. Living in today’s Information Overload Age, you must quiet your mind BEFORE you can be more productive and prosperous. Explode your daily productivity with my 3-D method. Try this organization strategy for one week, and you’ll find new hours to enhance your business and personal accomplishments. Discover my incredible mind-framing tool called AfformationsTM used by hundreds of thousands to attract abundance, end bad habits, and manifest desires. In just seconds a day, you strengthen your confidence and improve your results. Learn to control your own “Habit Loop”... a subconscious 3-part continuous cycle that guarantees your bad habits today will still be with you 10 years from now. That is, until I teach you how to PERMANENTLY INTERRUPT this pattern and replace it with rewarding, productive habits. Learn how to engage your “Loving Mirrors” by connecting with people who see greatness within you. Aligning yourself with those who are instrumental in maximizing your self-confidence is essential to your personal and professional success. How my C.L.E.A.R. Formula will empower you to eradicate neediness and be a steel curtain of confidence. Use this confidence-builder to always stand tall to cyber-bullies and snarky comments on Facebook, Twitter, and email. Identify your specific personality type — Calm extrovert, Anxious extrovert, Calm introvert, or Anxious Introvert. Then, learn how to add value to yourself and the world around you. While I was living in my parents’ basement, I had a lot of time on my hands. And much of that time was spent devouring one personal development book and program after another. Today, I continue my hunger for learning the absolute fastest and most proven way to achieve everything you want in life. Nowhere have I come across content that holds a candle to the unique and immensely beneficial life instruction that I present in Power Habits of Ultimate Self-Confidence. I promise, you’ll gain new ideas, new direction, and new results from my newest audio program. Of course, if you simply listen, and don’t take the ideas and action steps to heart, you may not experience the incredible results that are found throughout this page. However, if you DO give my ideas and instruction the time and attention it deserves, there’s no doubt in my mind that you will experience at least one phenomenal result… if not more… in the next 30 days. Of course, if there is any reason you do not experience a rise in self-confidence and results, simply send the program back to Nightingale-Conant for a full refund or exchange – whichever you prefer. When that happens, I bet you immediately feel proud and accomplished. Your energy level, productivity, and accomplishments soar. And you can’t help but smile and be in a good mood the rest of that day. Now, imagine if you didn’t have to rely on others’ telling you how great you are. What if you automatically and constantly did that YOURSELF! You ALWAYS value yourself. You ALWAYS believe you can achieve anything. You ALWAYS laugh in the face of fear, worry, and stress. Rather than wait and hope for outside recognition and approval, you constantly develop it yourself from within. At that moment… when your ultimate self-confidence becomes an automatic habit you can count on… that’s when you turn the page to your greatest life. Go ahead and click the BUY NOW link. With Nightingale-Conant’s RISK-FREE offer, you truly have nothing to lose. And a greater self-confidence and far greater results to gain! I want to be overflowing with self-confidence at work, home… always. And I want to achieve the kind of money, relationships, success, and lifestyle that come by having ultimate self-confidence. Self-Confidence, at the special price below. - I can select one of two ways of ordering.